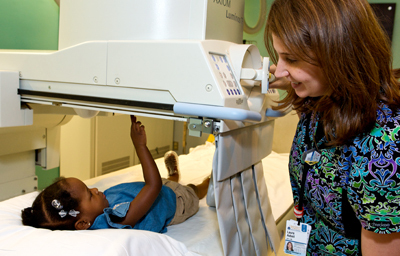 The Division of Pediatric Imaging is an integral part of the UVA Children’s Hospital. We work closely with our colleagues in pediatric medical and surgical specialties and subspecialties to deliver exceptional imaging services and care to our young patients in a family friendly setting. When in need of imaging services, the family can rest assured that their child is in the experienced and caring hands of our highly-trained pediatric imaging experts. Unlike many other healthcare providers, our pediatric physician radiologists are trained specifically in the subspecialty of pediatric imaging and focus solely on providing imaging services for children and teens. Being in a medical setting can sometimes be upsetting to a young child, so we strive to make their experience as comfortable as possible. Our staff is skilled at calming a nervous child, reducing their anxiety and completing the exam in the shortest amount of time possible. Children can watch videos, and our technologists employ a variety of methods to help soothe infants and toddlers during a procedure. We have a dedicated staff of Radiology physicists who continually monitor our equipment to ensure that minimum radiation doses are used while still maintaining excellent image quality. In addition, we have the latest in CT technology which requires much less radiation than previous CT scanners. It’s also faster, which enables the scan to be completed without having to sedate the child.